I was recently at Walmart creeping on the Flower Beauty display, thinking about trying a few new things. I'd heard so many good things about the line in the past, but I hadn't personally had the best of luck. If you saw my review on the BB Cream, you'll know that I ended up returning it, but I also picked up one of the holiday sets on Boxing Day and found the shadows to be... significantly less amazing than I was expecting after having heard them compared to the much loved Wet N Wild Color Icon shadows. 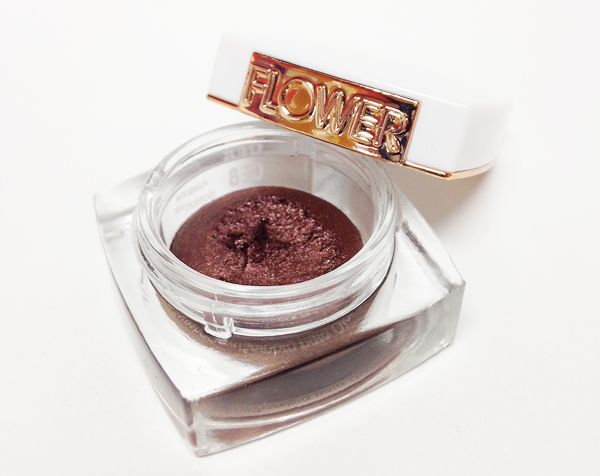 I wasn't ready to give up, however, and so I picked up this cream shadow that I know I'd heard good things about. Keep reading to see if it ended up being a winner. Like with all of the Flower Beauty products, the packaging for this cream eyeshadow is completely on point. From the sleek glass tub, which reminds me a lot of the L'Oreal Infallible eyeshadows, but ultimately beats them because you don't have to keep the ugly label on the top to remember the shade name, to the beautiful rose gold accents, this is a packaging winner that I'd have no issue keeping out on my vanity. Aside from being lovely to look at, it's very functional. The glass tub feels significant, like I could drop it and it's going to be able to withstand the impact, the lid secures nice and tightly so that I don't have to worry about this drying out before it's time, and there's a stopper to keep the moussey textured cream from moving around too much. This is definite packaging win. The claims on this product are basically that it's going to be an incredibly blendable, easy to work with formula that sets to a lightweight, longwearing finish. I have to tell you guys... I can't remember the last time the claims for an eye product were so bang on for me. Like I said above, this product has a much more mousse type texture, rather than a thick cream, with really high pigmentation. Trust me, very little of this product goes a very long way on the eyes. I find that one gentle tap of my finger in the product is enough to give full coverage to my entire lid and a blend in the crease. When it sets, it feels comfortable and lightweight and I haven't noticed any smudging or flaking with this product. The way that I've been applying this is to first pat it on with my finger over the lid and then use a fluffy synthetic brush to blend out the edges for a seamless one shadow look. I've worn this on its own and also topped with a powder shadow in a similar tone and I find that it wears really nicely either way. This definitely isn't a cream product that you need to set with a powder to get decent wear time out of. In fact, I found that this wore really nicely all day without any creasing on my lids - though I would add that I do have dry lids so creasing isn't a huge problem for me generally. Another plus for this product is that you can wear it a few different ways. You can easily sheer it out for a really soft wash of colour over the lid, but you can also pack on a second layer for a really punchy, full color look. 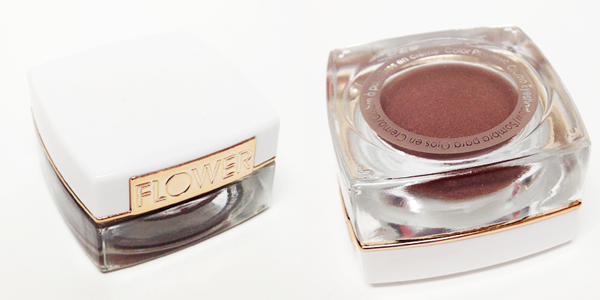 This shade, Awesome Blossom, is a pretty universal shade. I would say that if you're looking for more drugstore products that fall into the Marsala family, this is a great option. 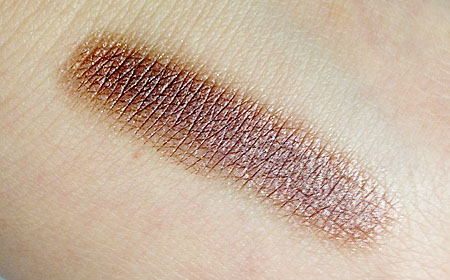 I would say that it looks more like a rich wine shade in the tub, but once it's applied or swatched it has a strong hit of deep, golden brown to it that gives it more warmth and makes it pretty unique. I think that this shade would really work quite beautifully on all skin tones, especially since it has a lot of shimmer and shine that I think would look absolutely amazing on really deep skin tones. I have to say, I'm fairly in love with this shadow and have every intention of picking up a couple of other shades - especially Wild Geranium (which I was sold by after seeing Zoe's review) and also Flirty Floret, which is a deep golden chocolate shade that I think will get a lot of wear in my collection. 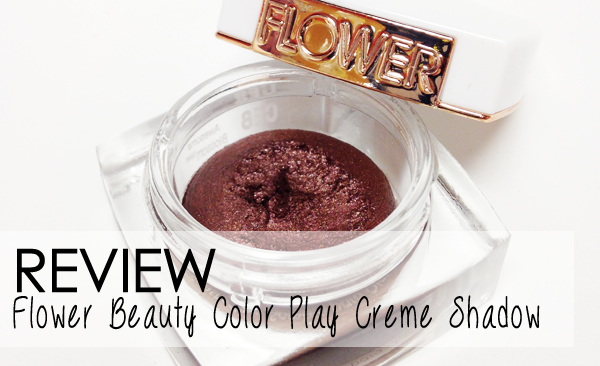 Have you tried the Flower Beauty Color Play Creme Eyeshadows?